One day soon it’ll be a normal thing to suggest visiting Sakai City when you’re passing through Osaka, but I’m getting in early to tell you: go to Sakai! Back when I lived in Osaka, I knew Sakai was south of the city and that’s about all; I occasionally met people who worked there. Beyond that, I knew nothing. But Sakai is on the up-and-up, as they say, and on my recent trip I was introduced to a tonne of great stuff to see and do there. I recognised the keyhole-shaped kofun burial mounds as soon as we got to the top of the Sakai City Hall building (there’s a great open viewing floor at the top on the 21st floor – free for anyone to come up and look out over Sakai and beyond, and including some displays and info). I spent a year living in Amagatsuji, Nara, next to the Suinin kofun – an emperor’s burial mound with a walking path around it just a few minutes from my apartment. Basically, they’re enormous earth mounds (now green with plants) which date back to the third century, and are basically the ancient Japanese equivalent of an Egyptian pyramid. Just to make them extra-picturesque, they’re usually surrounded by moats. At the moment a group of these mounds found in Sakai (and nearby Habikino and Fujidera), jointly called the Mozu-Furuichi Konfungun (or the Mozu Tumulus Cluster), are on their way to being World Heritage-listed, so I suspect you’ll start to hear more about them in the coming years. 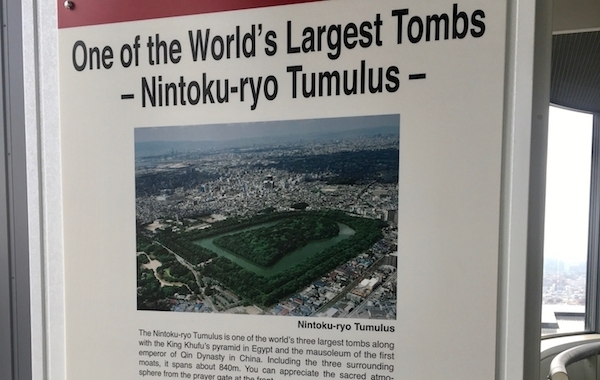 Sakai is home to the biggest one, the tomb of Emperor Nintoku, plus 43 more! The history behind them is fascinating and well worth exploring. One of the newer attractions in Sakai is the Plaza of Rikyu and Akiko which is a cultural centre with various exhibitions, activities and information for visitors. It’s named after two important historical figures from Sakai – Sen no Rikyu was a tea master who developed one of the most important tea ceremony traditions in Japan, while Akiko Yosano was a famous poet and (very interestingly for her time) a feminist and pacifist – if you’re as intrigued as I was, start reading more about Yosano here. The plaza is an impressive building to begin with and then inside is really varied. I was shown through to several of the authentic tea ceremony rooms, the kind where every part of the room is there for a specific reason, and they overlooked one of those utterly perfect Japanese gardens. But best of all, there is a regular “casual” tea ceremony which makes it easy for lots of people to see the basics of tea ceremony (and have a go, too). Several women in beautiful kimonos run the ceremony and serve up a perfect cup of matcha (the green tea whisked from a powder) along with a mochi-style sweet – and the decorations on the sweets change to reflect the season. 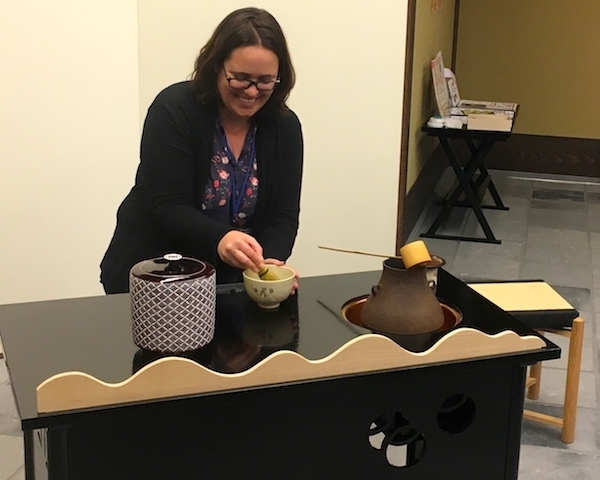 I’ve been involved in more authentic tea ceremonies in the past and they can be trickier to follow and quite serious (personally I love them, but they’re probably not for everyone) so I really loved that they have this casual version set up for drop-in visitors. 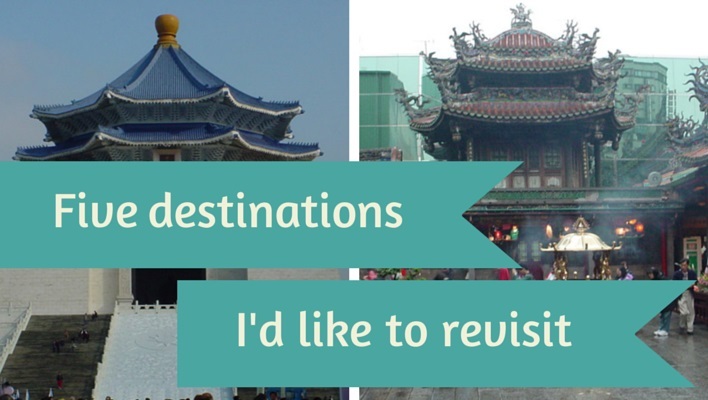 But the serious options are there too, so there’s something for everyone. 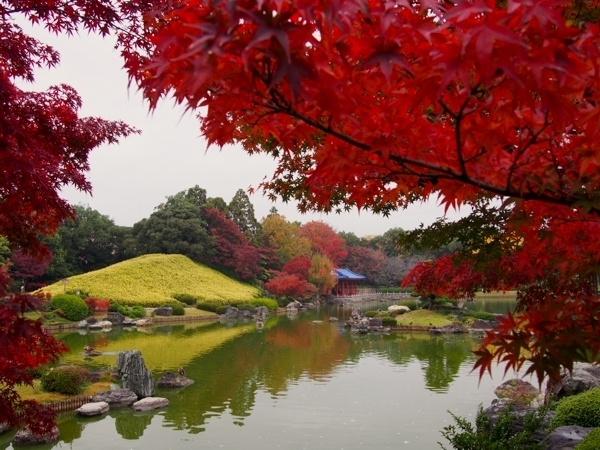 Japanese parks and gardens are beautiful all-year round because they are so well-cared for and of course the ones in Sakai were no exception. I was shown through Daisen Park (surrounding some of the burial mounds) and it was just gorgeous. Here in Perth we don’t get much in the way of autumn foliage so strolling through on an autumn day meant I couldn’t stop taking photos. Within Daisen Park there’s a Japanese garden and my camera went extra-crazy there. It’s a very traditional one (in the Tsukiyama Rinsen Kaiyu style, for the experts) and it is honestly the kind of place I would happily spend a whole day, strolling with a camera then sitting in a peaceful spot with a book. I’d forgotten how much I loved Japanese gardens. And briefly contemplated how I could transform part of my own garden at home to this style then realised how much work it would be and decided it would be easier just to return to Japan regularly! 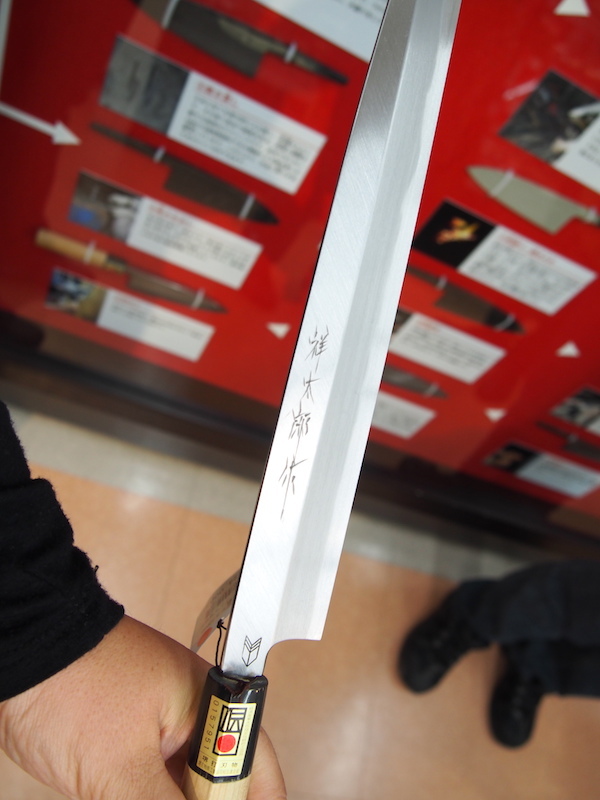 One of Sakai’s big drawcards is that it has a centuries-old tradition of metal work and is famed for making excellent-quality knives, swords, scissors and basically anything with a sharp blade! It’s pretty easy to spot the Sakai City Traditional Crafts Museum because it’s got a giant knife hanging above the entrance. Inside there is an amazing gift shop (yes, I have a bit of an obsession with good museum gift shops, so forgive me!) with lots of authentic local souvenirs, including lots of useful kitchen-related stuff, which I think are so good to take home because you can regularly remember your trip when you use them. Upstairs is the main part of the museum, a room really, really full of blades of all kinds – many knives and then swords and scissors too. The knives were fascinating because there were so many for very specific uses (different types of sushi, special handmade paper edges, and many more). Continuing the metalwork theme, I also had the chance to watch a metal forger in action. 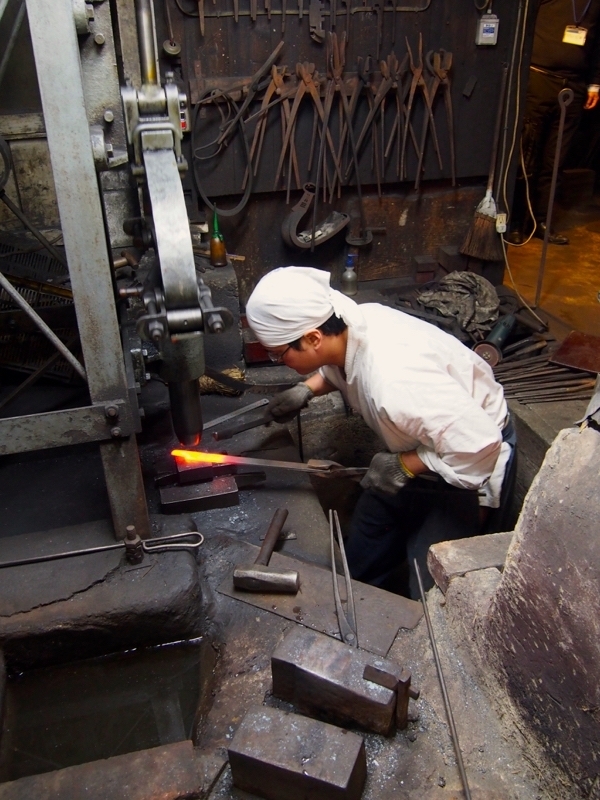 Behind a small shopfront we were taken to a forger’s room that looked centuries old, and got to watch a total master craftsman at work in the Mizuno Tanrenjo metal forging studio. The Mizuno family have been making knives in Sakai for 150 years, it turns out, and watching the process gave me a fascinating insight into something I’d never given much thought to before – now that I’m home I look at my kitchen knives quite differently! The theme of delicious amazing incredible (and more and more adjectives) food during this trip to the Kansai area continued, of course, in Sakai. I honestly think it’s hard to find bad food in Japan; it’s very easy to find excellent food, though! Lunch was takoyaki (“octopus balls”, but really, small pieces of octopus fried in round balls of dough), and although I’ve eaten takoyaki dozens of times before, this was quite different! It’s usually a snack from a street stall – there was one I walked or cycle past on my way home from work every night when I lived in Higashiosaka – but we were taken to a sit-down takoyaki restaurant and the takoyaki were served on fancy plates with lots of tasty accompaniments. And dinner – oh, dinner, this was one of my favourite evenings in Japan! 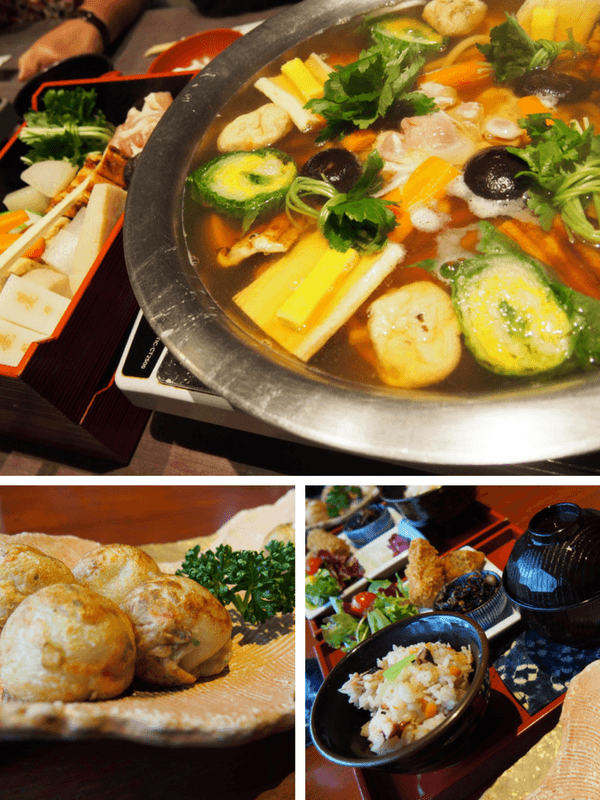 We were taken to Mimiu for an udon-suki meal – one of my favourite kinds of Japanese meals with a hotpot in the middle of the table and trays full of ingredients to throw in for simmering and then immediate eating. It was delicious, and the company was fabulous (our beautiful guide Mariko and two Sakai City staff) and just so much fun. Oh and did I say it tasted amazing?! See Sakai soon … OK?! 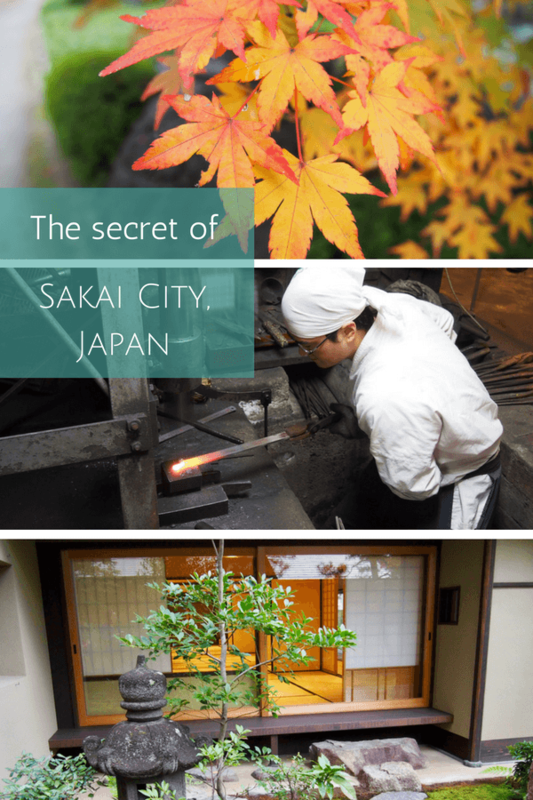 Places like Sakai are like a perfect experience for me: not too many people know about Sakai yet, but there is so much great stuff to do there. I do really love getting to know a place before the crowds do! It’s a great area to visit for a variety of authentically-Japanese experiences, and even just to see what “everyday Japan” looks like. It’s only a half-hour train trip from central Osaka – easy to get to – and they’re working hard for it to become better known, so I’d head there sooner rather than later. So you know: Universal Studios Japan, the City of Osaka, the City of Sakai and the City of Kobe all supported this trip to Japan, but as always, all my opinions are completely mine. Those burial mounds remind me of the ones in Gyeongju in South Korea. There are hundreds of them. There are the burial mounds for members of the Royal family of the Silla kingdom. Ooh interesting! Will have to check them out some day.